Superior Oysters & Shellfish from Vancouver Island, BC | Sawmill Bay Shellfish Co. Surrounded by beautiful, dramatic scenery, we work from Read Island’s crystal clear waters against a stunning backdrop of snowcapped mountains. Glacier fed inlets provide the perfect setting in which to farm our superior shellfish. 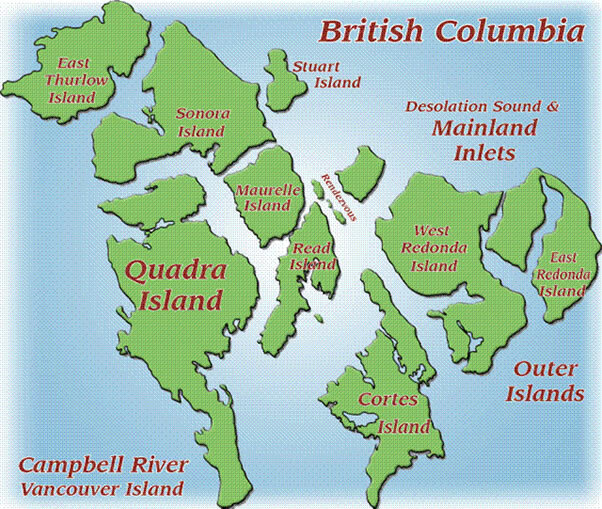 Read Island is situated between Quadra and Cortes Islands, and is a part of the Discovery Islands between Vancouver Island and mainland Canada. The island is about 19 kilometers long and between 2 and 6 kilometers wide. Read Island as a whole has a year round population of approximately 50 people, exploding to around 100 in the summer! Our farms are remote from human habitation ensuring a clean, pollution free environment for our products to grow in. Our first farm is a small bay situated on the south east end of Read Island. The farm is surrounded by crown forest lands and one small summer cabin. At this farm we have approximately 10 acres of beach (at low tide), on which we grow oysters and clams. Our second, mainly deep water farm is a sheltered little bay situated on the south west end of Read Island. About twenty minutes by boat from Sawmill Bay, this farm consists of approximately six acres of water on which we have about 30 rafts growing oysters suspended in the water. The site is bordered on one side by a protected provincial park and on the other side by crown forests. We also have a small summer cabin here. Although the human population on Read Island is small, the abundance of wildlife more than makes up! The pristine, remote area in which we farm provides a home to a diverse range of wildlife, including sea lions, seals, bald eagles and osprey to name just a few.